From all of us at Papua Explorers, we would like to wish you a Merry Christmas, Happy Holidays and a Happy New Year! As we look back over 2017, it’s been a busy and amazing time! Once again we had a year full of amazing diving experiences in Raja Ampat’s beautiful waters. From it’s reef flats to sea mounts to pinnacles and lagoons, diving and snorkelling in 2017 was filled with incredible sightings! This year our guests collaboratively saw – at a minimum – 821 mantas, 3440 sharks (9 species – including hammerhead!) and 1090 turtles. There were shy dugongs passing by the jetty, whales feeding on the house reef, and an extraordinary sighting of TEN ocean mantas at once at Blue Magic! We saw schooling barracuda and octopus hunting, immense schools of sweetlips just begging to photographed, and a first time sighting of the spectacular flamboyant cuttlefish. There was a baby wobbegong just 14cm long, mandarin fish mating, and of course… the stunning coral reef itself, teeming with life and bursting with color. During the year we said goodbye to Hakim, and hello to Annika and Steven. We hosted guests from 39 countries, and attended 9 dive shows all around the world! We made official our foundation, Raja Ampat SEA Centre, which received NGO status in March.. giving us an amazing platform to continue our conservation projects and sustainable community development work. restored over 500m2 of degraded reef and transplant over 5000 coral fragments with amazing success rate of 88%! 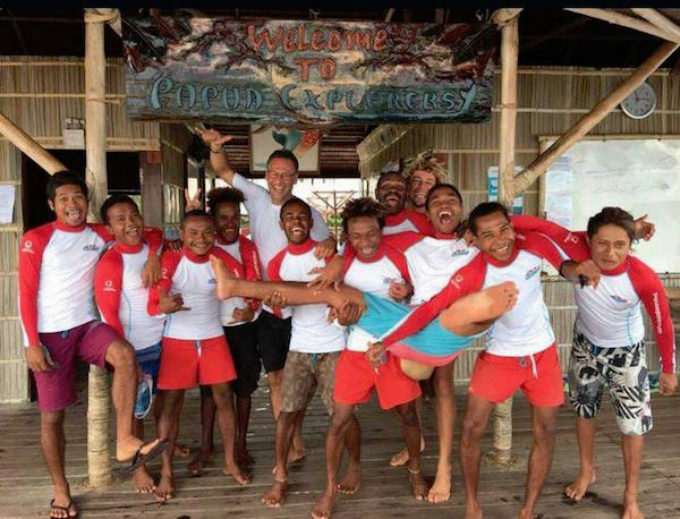 We also hosted our very first Coral Explorers trip, where, under the guidance of expert marine scientists guests and staff alike learned an incredible amount regarding coral ecology, and exactly why Raja Ampat is so very special and biodiverse. 2017 has been a very busy, but very rewarding year for Papua Explorers. And as always, we continue to be amazed by the incredible biodiversity and stunning life both above and below the water, and look forward to sharing this very special place with our guests again in 2018. Thankyou for all your support, and we wish you a Merry Christmas, Happy Holidays and Happy New Year to you!